Today trading started promising in the morning, but afternoon turned sour. Once again we see panic and nervousness returning to the pit. Today, markets lost ground and sold off. Nothing dramatic yet, but we could see an easement. What pushed stocks down? Among those companies which were dragging S&P 500 down were energy stocks (and as some media told us it was due to Russian sanctions) and surprisingly some dividend stocks were on the sale as well. Not all dividend stocks were on sale today. 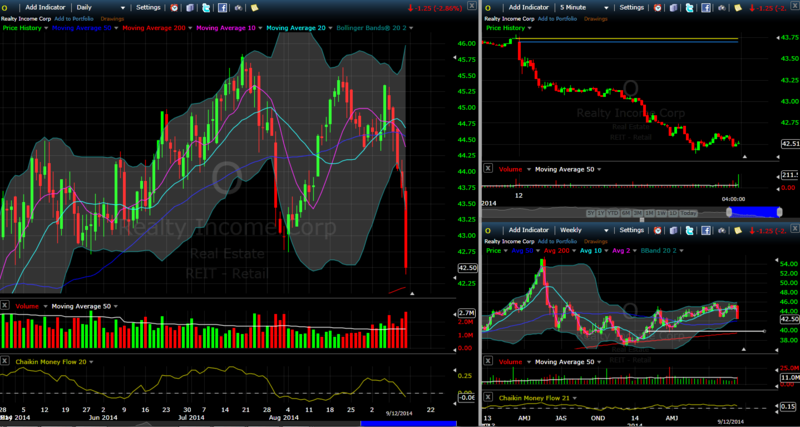 If you however hold MLPs, and REITs you probably have noticed a sell off around or even exceeding 3% drop. Some stocks are even back to a point where it makes sense to watch them closely and potentially buy more shares. 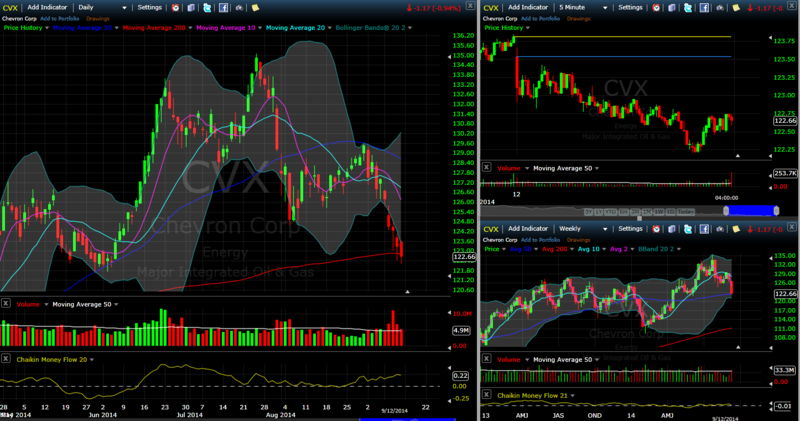 An energy stock dragged down for several days was Chevron (CVX). It currently sits at its support level at $122 a share. It went down from its 5 year high at $135 at the end of July this year and sold off hard on heavy volume on Russian / Ukraine tension. We saw a little break throughout August and in September the selloff gained its strength. It is in its full swing and at the beginning of it trend wave. The CVX median number is $120 a share and I believe we will see the stock to get to that point. I believe it will be a perfect point to either buy new shares or add to existing position. The DCF (discount cash flow) calculated fair value is at $134.84 thus buying at $120 a share will provide enough margin of safety. orporation: Is a Cash Flow Boom on the Way? 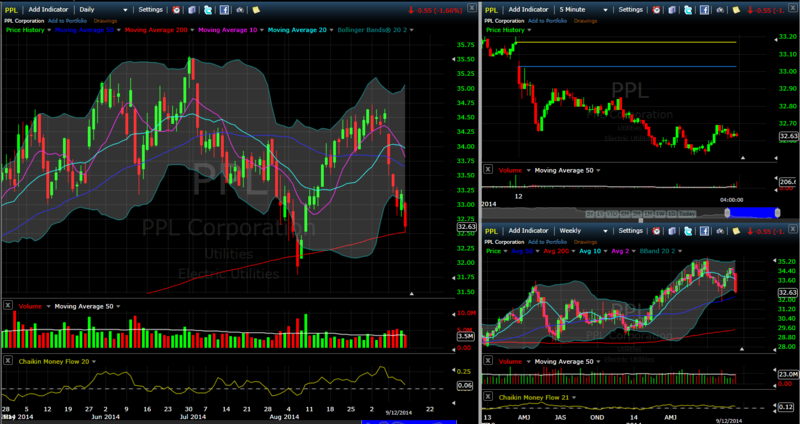 PPL is another energy stock (MLP) which is offering a good entry point. It’s not as good as Chevron, the stock would have to drop $30 a share (from today’s $32.64) to match Chevron’s path, but even at today’s level it is a fair entry point. As an energy stock the stock’s price action is the same as Chevron’s. The first sell off started at the beginning of July this year and with a small break in August we saw a renewed sell off in September. Last two years PPL had declining revenues due to acquisitions, but it increased dividends this year in February so I believe, it still is a good buy if the stock goes lower to $30 a share. The calculated fair value is at $37 a share so there will be good margin of safety at this price. If I was buying the stock, I would trace it down and I would use my contingency order strategy to buy the stock only at reversal. The stock is also starting a new down wave in the middle of a sell off, so I am expecting further price decline. What Should PPL Corp. Shareholders Do With A 65% Stake In Talen Energy? Realty Income (O) a monthly dividend company which pays dividends every month and tend to increase it every quarter increased dividends yesterday by 0.13%. It is nothing much, but I like monthly dividends which can be reinvested. Today the stock was under fire. The reason for REITs being under sell off today was most likely renewed fears that FED would increase interest rates sooner than what the investors anticipated. As some on the market consider this the end of the world, it offers a great opportunity to buy more shares. The stock has been range bound in $40 – $45 since June 2013 with a few exceptions at the end of 2013 year when the stock fell below $40 and touched $38 a share. Some people say the stock is still expensive and it will be expensive even at $40 a share, but I believe this stock will always be expensive. The reason is that this is a reliable company in the REIT industry which prides itself being a monthly dividend company for all seniors who rely on their regular monthly income. As our population is aging, more and more people will want to buy this stock which will be pushing its price higher although the valuation doesn’t justify it. So you have two options – you can wait for the proper price, or you can take TA (technical analysis) help to find the best possible entry. If you have waited for the good price entry, you have been probably waiting for more than 5 years already and the price still didn’t get closer to you to entry. And most likely it will never get back down to you. I believe that any price around $40 a share (+/- dollar) is a good entry. If get below $40 a share – even better, take it as a cherry on top of the cake. Today the stock sold off by 3% and again, we are at the beginning of a down wave, so the selloff may continue next week. If I was buying today (or next week) I would use contingency order to track the stock on its way down and buy at reversal. Calculating fair value is tricky for this stock. My own DCF calculation reveals a fair value to be at $11.95 a share, Morningstar estimates the value at $44 a share. You choose which one you want to use. 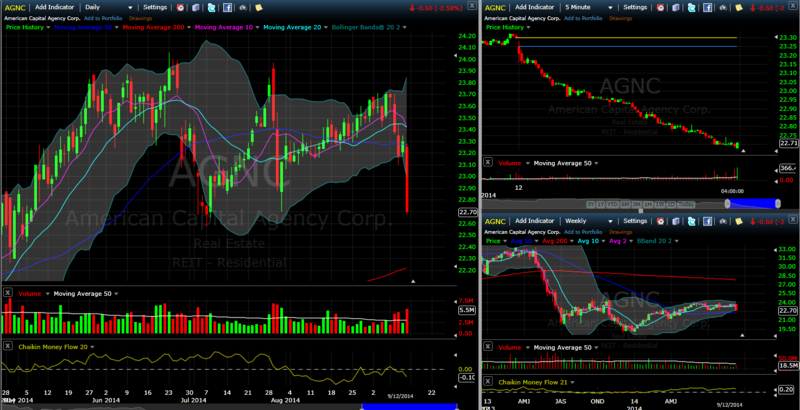 AGNC is a company involved in mortgage back securities and unlike Realty Income, it is sensitive to interest rates. Generally investors do not understand the difference and when they assumed that FED may increase interest rates they start selling everything what has “realty” in its description. So although Realty Income is not exposed to interest rates, it still will be sold off. AGNC is however exposed to interest rates, mainly to fast changes of the rates between long term and short term papers. AGNC makes money on a wide spread between those two. 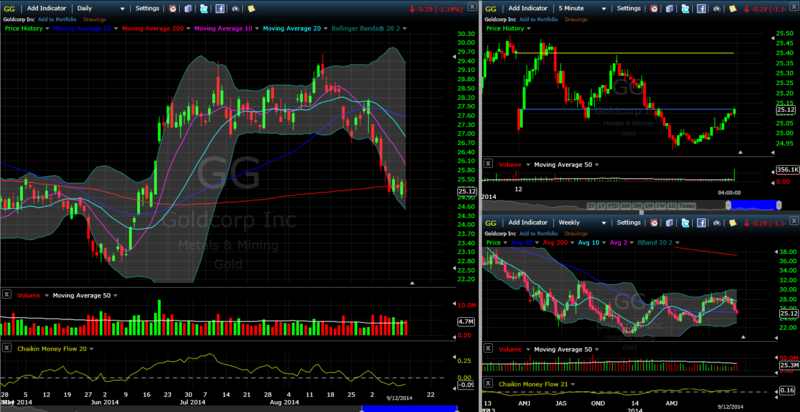 If the spread is open wide and changing slowly over time, AGNC can easily adjust its portfolio to those changes. Fast moves can however kill it. We have seen this in the past when the stock crashed from 30+ levels to current 20-ish levels within two months. Although we have heard talks about interest rates since July 2013 and AGNC is well aware of the future implications and adjusted its portfolio, investors yet continue panicking any time they hear about changes in the rates. Today’s slide in price is yet another example of ignorance. For educated dividend investors this slide is yet another great opportunity to buy more shares of one of the high quality mREIT stocks. A high quality mREIT doesn’t mean safe however. If you plan on buying this stock, you will be rewarded with a nice dividend payout, but be aware that this stock is one of the riskier dividend stocks. I own shares of this stock, I have owned it for years and believe this stock will perform well. I was buying when the stock was selling at 30, 31 and even 33 a share and yet dividends and a few purchases at $20 a share lowered my cost basis down to 24 a share. My overall loss on capital is only -5%. When the stock recovers back to its 30s (and it is slowly rising) I will be positive, enjoying dividends on the road. The company had to cut dividends several times. The last cut happened in December 2013. Since then the dividend rate holds and the company is poised for increasing it once again. Time will show. If you are okay on adding a bit aggressive and risky stock to pepper up your portfolio, AGNC can be a good candidate. I Recently Increased My American Capital Position, Should It Be In Your Portfolio? 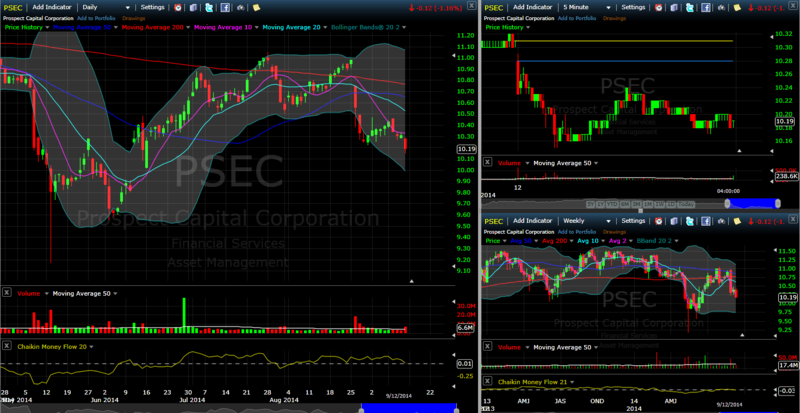 PSEC is a BDC (Business Development Company) which makes money investing into other businesses. This stock is considered by other investors as one of the best in this industry. It is not a true dividend growth company but it pays hefty dividend monthly. I use this stock as an income generating machine where the received dividends are used to buy other dividend growth stocks. I do not expect any growth, but it paid its dividend consistently since 2004 and it even increased it for two consecutive years. If played correctly you can make money and collect nice dividends. The stock has been range bound for years between $9.5 – $11.50 range. Whenever the stock approaches the lower level I usually add more shares to this stock. We have been there in June this year when the stock sold off, today we are slowly approaching to these levels once again. I consider everything around $10 a share (+/- 0.5 c) a good entry point. My calculated fair value is at $15.93 a share, thus buying at the current levels can be a good opportunity. A Brief Primer on Business Development Companies (BDC) Part 1: What are BDCs and why should you invest in them? 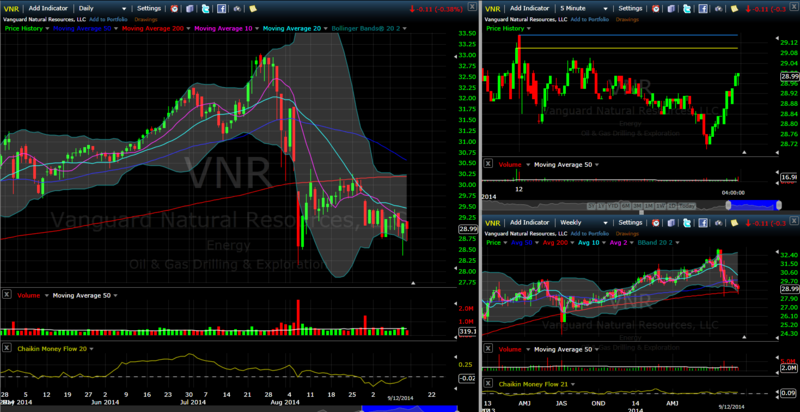 VNR is another MLP involved in oil and natural gas extraction. Although it is in Basic Materials sector, due to exposure oil and gas prices and recent Russia tension it is affected by sanctions and therefore the stock experienced the same sell off as energy stocks. It is yet another stock similar to PSEC above – my money making machine which helps me buying more quality stocks than VNR. It is not a true dividend growth stock though. It doesn’t increase dividends much. Dividend increases in the past are offset by dividend cuts. What to expect from this stock then? Nice dividend. Once again, if played well you can make money and collect dividends. The median price for this stock is $28 a share. Today the stock fell to that level. Adding at the current price or waiting for $28 a share or bellow could be a good strategy to add this stock if you want a hefty dividend which can be reused for buying other high quality stocks. It depends on your strategy. This stock is already at the end of a downward wave, so I do not expect this stock to continue falling further. It may continue sideway, maybe slightly drifting down or slightly drifting up. Vanguard Natural Resources: Is The Recent Weakness A Buying Opportunity? Goldcorp is a mining company involved in precious metals, mainly gold. It moves in waves and it can be an interesting capital gain play stock with a decent dividend. It is not a true dividend growth stock, but it does well so far and can be a good addition to the dividend portfolio if you want exposure to mining companies. It experienced its up & downs on the way during the last 5 year history of this stock and thus you have to play it that way. To make money, you want to be buying at the bottom of those waves. Although I am not advocating bottom fishing here, when you look at the chart you could see nice waves with lows at $22 a share in December 2013, $24.50 a share in April 2014, $22.50 in June 2014 and today we are approaching to those levels once again. The stock is in the middle of its downward wave, so I am expecting further decline. The best play to buy into this stock would be using the contingency order by tracking the stock on its way down and buy a reversal. If you enter in, you will be receiving a decent dividend while riding the new wave up to 30-ish levels. There you may sell or stay in (hold) and wait for the next down-wave to add more shares. Morningstar estimates its fair value at $27 a share, so if they are right, you will have some margin of safety at these levels. These were a few stocks from MLP, REIT, and BDC industries which were recently beaten down and which caught my attention as good candidates to enter a new position or add more shares. Except Chevron & Goldcorp I own them all in my portfolios (either TD or ROTH) and next week I may take advantage of this decline to add either of them to my portfolio. I am not decided yet which one would be the best stock to add, if opening a new position in Chevron or Goldcorp or just add more shares to the existing companies. I will make my decision on Monday next week. What about you? Are you planning on taking advantage of the decline in these stocks? Thanks for sharing some potential investment opportunities courtesy of Mr. Market. I am curious to know what you think about many of the healthcare REITs especially HCP, VTR and OHI. You mention several other REITs above but I am taking an interest in the health sector. Thanks in advance. I’ll look at them and let you know.